On his way back to his native Argentina, aboard the steamship Río de la Plata, a young winemaker fell hopelessly in love with a beautiful young maiden, the daughter of a wealthy south Buenos Aires landowner. He was returning from furthering studies in France while she reflected over her travels around Europe. Disembarking in the port of Buenos Aires they swore they’d see each other soon. Letters dated 1929 and 1930 found in a Mendoza wine cellar recount Pilar and Tomás’ story. After a series of emotional written exchanges, correspondence from the damsel who kept him awake at night suddenly ceased. Distraught, he decided to find out what had happened. On arrival at her house, her father refused Tomás entry saying he was not fit for his daughter. Tomás, in a lovelorn attempt to draw her attention and defiant to the last, marked his wines with the personal, Pampas del Sur seal she had used on her letters. The combination of talented winemaker Fernando Piottante’s know-how and devoted care in the vineyard make wines from Pampas del Sur an excellent choice. 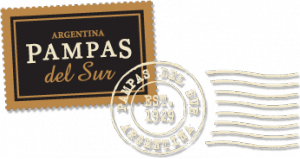 Pampas del Sur provides a wide portfolio including easy to drink wines up to wines of great complexity. It gives consumers a vast range of choices that cover different situations, while preserving quality and delivering modern style in all its packaging. Estilo Pampas and Gran Pampas are the latest additions to our range of premium wines, which have already begun garnering valuable awards at the world’s most prestigious wine competitions.